My name is Heath Anderson. This is my blog. 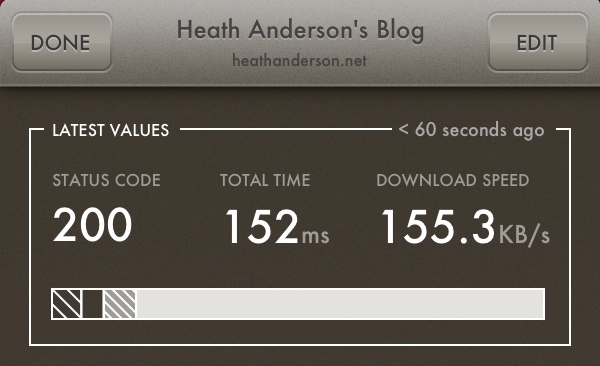 Vigil is an easy-to-use, inexpensive website monitoring app for iOS. I've been using Vigil for the past few months to monitor 16 sites. It has notified me of two separate issues during that time: a bandwidth overage for a Wordpress site and a (user managed) SSL certificate expiration. About a month ago I did receive a couple of notifications in error, but the Vigil twitter account did a good job of communicating the problems they were having. That is the only issue I've encountered with the service, and it was a minor one. @iain It is not possible in the client currently, but we are working on adding more detailed history views for the next major release. The thing that first caught my eye about the service was the price: $9.99 for a year of monitoring an "unlimited" number of websites. That is extremely affordable. For comparison, the cheapest plan at Pingdom monitors up to 10 sites for $9.95 / month. It was a no-brainer to try out, and I'm extrememly glad that I did. I just found out that the videos for Skepticon 5 are online. I've embeded some of my favorites below. I didn’t get off to a great start with the Hidden Radio Bluetooth speaker. I was impatient so I tried to use it just a few minutes after plugging the speaker for its initial charge. My phone started randomly disconnecting from the speaker. This problem went away after letting the speaker charge for a couple of hours. Another problem I ran into was with the twist to control mechanism. The Hidden Radio is turned on by twisting the top part of the speaker. This also increases the volume. The problem was with the base. It wouldn’t easily stay in place while turning its top. I was having to push down and turn. This didn’t work very well. I eventually found that cleaning the grippy material on the base with some water completely fixed the issue. Hopefully this isn’t something that has to be done too often. I have the silver colored one. I don’t really care for the plastic-aping-metal look. It looks fine, but I think I would go with black if I had the chance. I am mostly using the speaker to listen to podcasts, and I have no complaints with regards to audio quality or volume. It seems roughly comparable to other speakers of it’s size. The location of the micro USB port is annoying. It is on the bottom of the speaker at an odd angle. I find it difficult to both insert and remove the USB cable. This port charges the speaker. The Hidden Radio has a built in battery and is meant to be portable. I would be more likely to use it this way if the charging cable port was more accessible. The brightness of the the always-on (when plugged in) indicator light is another annoyance. I do have some light blocker stickers that help the situation. I wish the light would go off or dim significantly once the speaker is charged and turned off. Although I do like the simplictiy of its design, I don’t think I would pay $119 (the Kickstarter price) for it again. I would probably go cheaper with GOgroove BlueSYNC OR3, or more expensive and look at the Jawbone JAMBOX. The retail price for the Hidden Radio is $149. Do I Really Need An iPhone Dock? Probably not. But I’m still using it. I’ve used the Elevation Dock with Lightning Adapter for a couple of weeks now. Using the dock for another week really hasn’t done much to improve my opinion of the gadget. It is easier to put the phone in the dock than to directly plug in the lightning cable. On the other hand it is much easier to disconnect the cable than to undock the phone. I’m not sure how to weigh these two facts against each other. At best it is a wash. Right now I’m mostly continuing to use the dock because I like the way it looks. I suppose I will continue to use the Elevation Dock until I either find something better or get frustrated enough with the undocking procedure to decide to go dock-less. Or I may actually try some kind of adhesive to attach the dock to my night stand. That seems like a really bad idea, right? Earlier this year I received my Elevation Dock after funding the Kickstarter. I loved it. It was the absolutely the best docking solution available. Due to its low friction connector and heft it was even easier to use than just a cable. I could drop in my phone to charge, then grab it and go. No hassles. Getting the iPhone 5 kind of ruined that arrangement for me. I've been stuck charging with a plain cable (awful, I know). At least with the Lightning cable I could plug it in without having to study it to make sure I'm inserting it correctly. 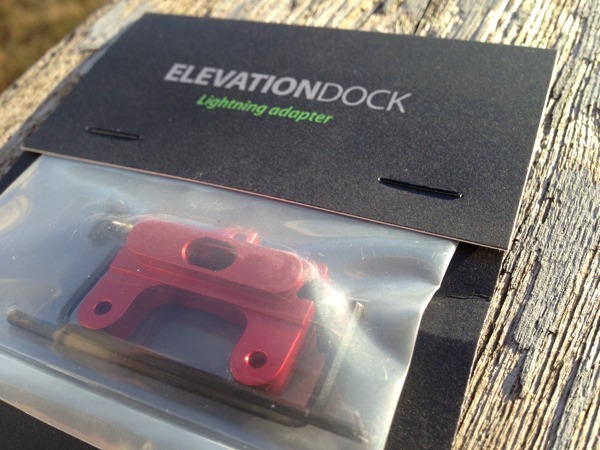 Thankfully Elevation Lab has released a Lightning adapter. I ordered one as soon as they were available. It arrived earlier this week. Installing the adapter was easy enough. Luckily I had an extra Lightning cable to use with it. The adapter looks nice, and works well enough. The main problem is that Apple's Lightning connector produces too much friction to undock the phone with one hand. I now have to hold down the dock to get my phone. 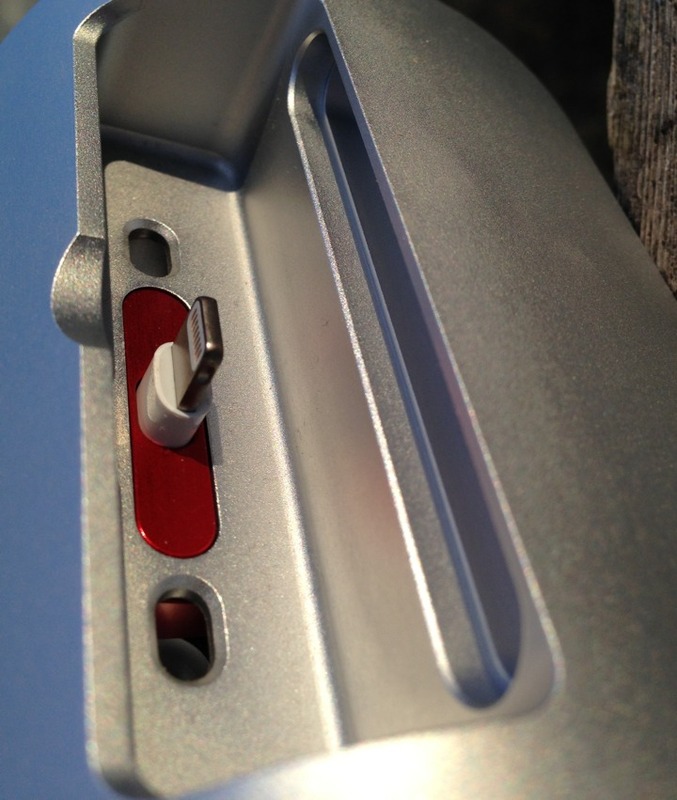 The lightning connector, like all of Apple's 30pin connectors, are higher friction than our custom 30pin connectors shipped with your docks. But with the ElevationDock's weight, just some pressure from your pinky and you can remove your phone without the base moving. I still like the dock. The iPhone 5 version just isn't as useful as the 4/4S one. The Lightning adapter is well made, and I don't think they could have done a better job. It is my understanding that it is currently impossible for 3rd parties to create their own versions of Apple's Lightning connector. This means that Elevation Lab has made the best possible product given the current limitations. The Elevation Dock is still the best iPhone dock I have found.